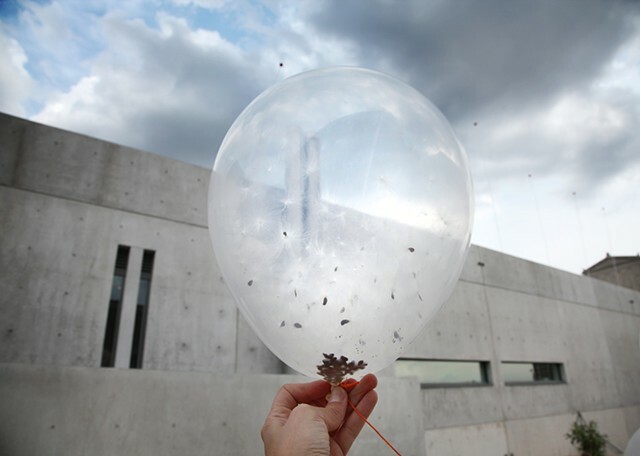 Milkweed Dispersal Balloons is a food cart for monarch butterflies which has been traveling to museums, farmers' markets and other public venues along the path of the North American monarch migration. 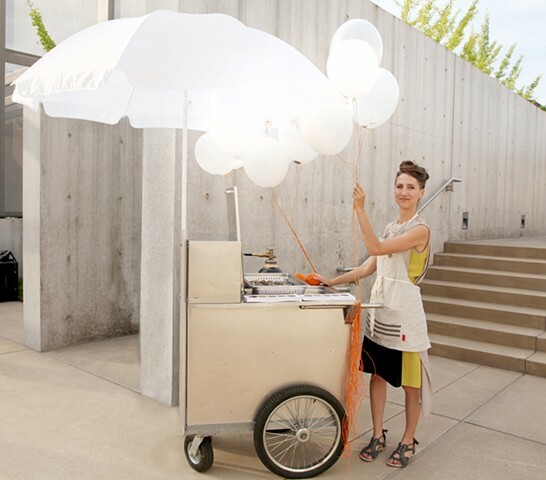 Visitors to the cart are given clear balloons filled with the seeds of milkweed—the only plant on which monarch butterflies feed—to take back to their neighborhoods and pop, releasing the fluffy, floating seeds. These seeds will grow and provide an important food source for monarch butterflies and caterpillars for years to come. If you're interested in replicating this project, I consider it an 'open source' idea and am happy to see the project spread. It is licensed for non-commercial use under Creative Commons. Please contact me for more information and instructions. 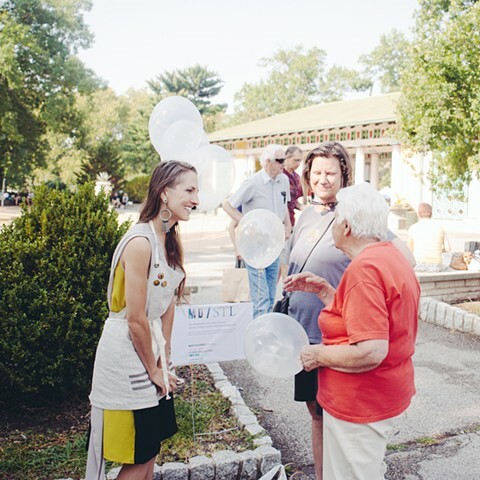 Please note that myself and NRDC recommend strongly against releasing balloons (the MDB balloons are intended to be popped). 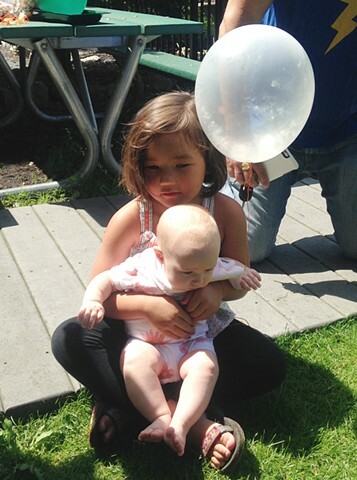 Even though the natural latex balloons eventually biodegrade, they can be a hazard to wildlife in the meantime. If just want to plant milkweed in your yard, you can use the Xerces Society's milkweed seed finder here. 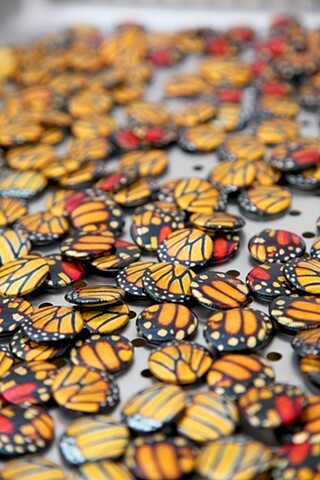 PROJECT STATEMENT: In what is perhaps the greatest migration on Earth, monarchs fly through the Midwest to Canada and then back to Mexico each year – a distance spanning more than 2,500 miles and several generations. This incredible journey inspires awe and reminds us of the astounding capabilities and beauty of the natural world. Unfortunately, as climate change disrupts the delicate timing of this migration, and herbicide and pesticide use increases, monarch populations have dropped by as much as 90% in recent years. Unthinkably, the iconic and inspiring monarch may be in danger of disappearing from our Earth forever. As the agriculture industry continues its use of potent weed killers like Monsanto’s Roundup (glyphosate) developed for patented GMO crops, populations of native milkweeds, the only plants on which monarch caterpillars feed, have plummeted. Because of this, scientists have identified that one of the most meaningful steps that can be taken to help the monarch population is to protect and plant milkweed, especially the hearty Common Milkweed, also known as Butterfly Flower (Asclepias syriaca). An abundance of these native food sources would increase monarch butterflies’ resilience in the face of pressures levied by climate change. 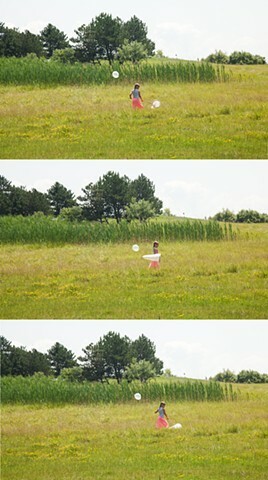 In response to this growing problem, NRDC artist-in-residence Jenny Kendler has developed Milkweed Dispersal Balloons. The project seeks to raise awareness of the dangers pesticides, habitat loss and climate change poses to pollinators; explain the ecological and economic importance of pollinators in general and the plight of monarchs, in particular; and encourage communities in St. Louis (world headquarters of Monsanto) and across the Midwest, to take action to protect this unique species. 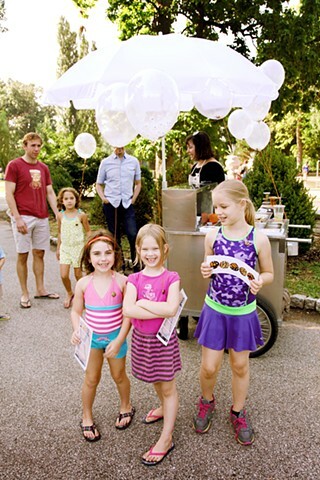 The project consists of a performative, mobile “food cart” that distributes milkweed seeds throughout St. Louis, supporting the threatened monarch population. 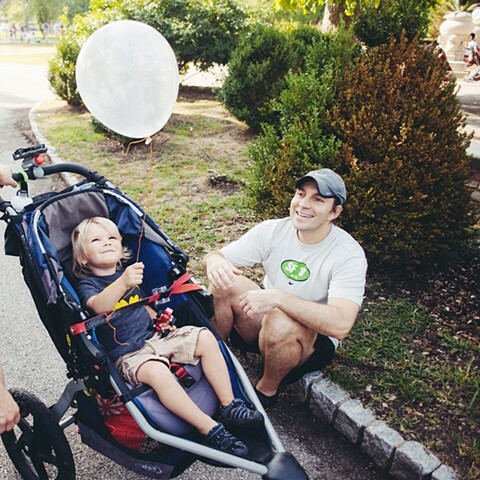 The artist and a team of performers walk the specially designed cart through Midwestern cities, engaging with families and individuals, by passing out biodegradable balloons filled with floating cloud-like milkweed seeds. 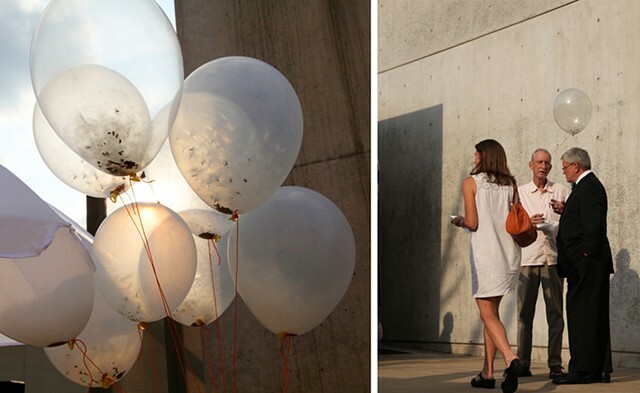 These transparent balloons are pinned to people’s shirts with buttons showing fragmentary close-ups of monarch wings, as the story of the interaction between milkweed and monarchs is told. 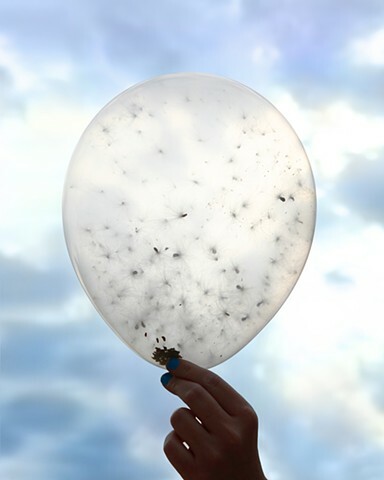 Participants, who are asked to take the balloons back to their neighborhoods and pop them outside, become the agents of seed dispersal releasing the floating milkweed seeds, where the resilient plants find places to grow in parkways, backyards and alleys. These plants will support migrating monarch populations in the years to come. 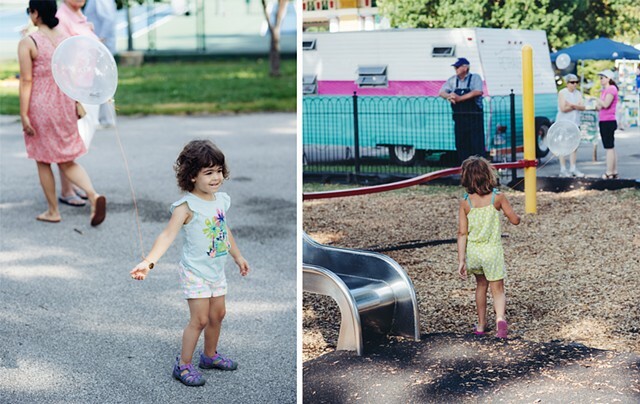 The monarch food cart has been traveling across the country, with recent & upcoming appearances in St. Louis, Chicago, Washington DC and Buffalo, NY — dispensing ‘butterfly food’ and information, emphasizing these beautiful and remarkable insects’ importance, and as a potent reminder of the human need for connection with the natural world. 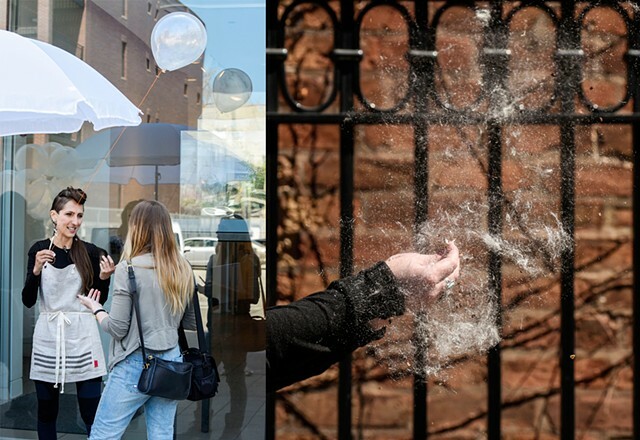 'Milkweed Dispersal Balloons' was originally created thanks to a grant from the Robert Rauschenberg Foundation and the Pulitzer Arts Foundation and initially presented at Marfa Dialogues/St. 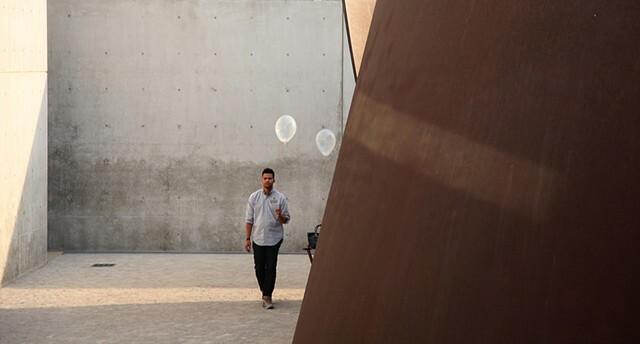 Louis through a partnership between the Pulitzer Arts Foundation, Ballroom Marfa & the Public Concern Foundation. 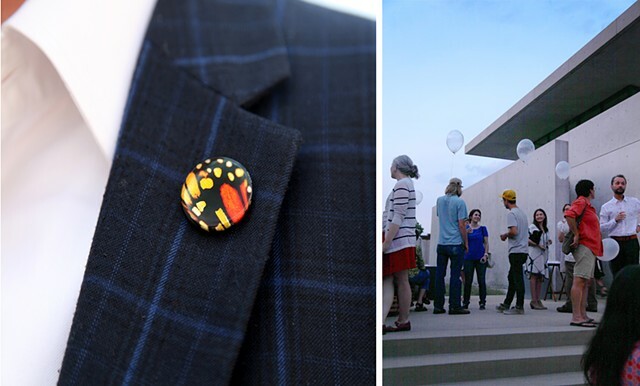 It has traveled to many other locations and museums, including the Albright-Knox and the DePaul Art Museum. Milkweed seed for the project has been donated by several amazing organizations, including the largest tallgrass prairie restoration project, Midewin National Tallgrass Prairie and Eastern Monarch Butterfly Farms. 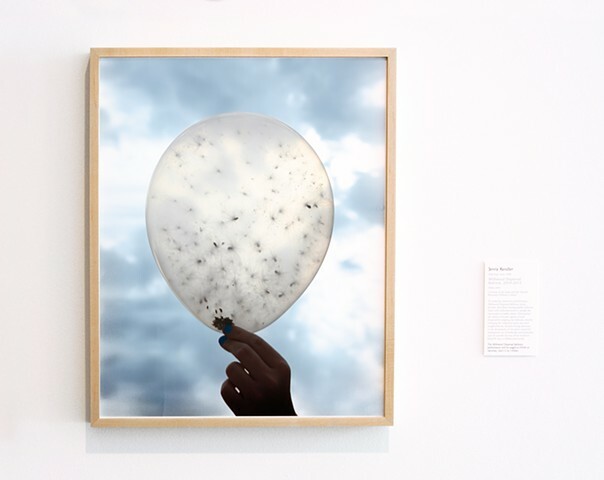 Buffalo News • "Jenny Kendler takes W. New Yorkers into the weeds"
Chicago Sun-Times • "Dirt+Art+Activism=DePaul University Exhibit"
OnEarth Magazine • "Bombs for Butterflies"
Chicago Gallery News • "Realizing human relationships with nature through art"